Aboi's Blog: What You Don't Learn In School: About Bonds - What? Buy, Sell or Hold? I have been asked - What is a bond? A financial instrument. 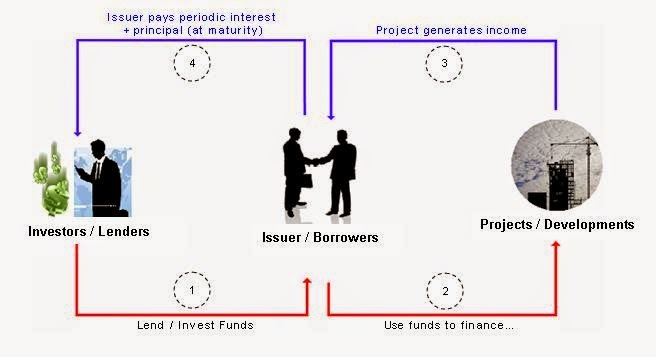 More specifically it is a loan of money to either a company or government in return for a promise (not a guarantee because it can default) to pay you (the lender) a given rate of interest for a fixed period of time. e.g. usually measured in years (2 years, 5 years...maybe 10, 20 or even 30). This interest rate is often called the coupon rate while the date at which the issuer has to repay you the amount borrowed is called maturity date. Say you buy a bond from an issuer (say the government, in Malaysia it is called Malaysian Government Securities or MGS) with a face value of RM1000, a coupon of 4% and a maturity of 10 years. This simply means you'll receive a total of RM40 (RM1000*4%) of interest per year for the next 10 years. When the bond matures after 10 years, you will get your RM1000 back. What most people don't know is that bonds are safer than equities (stocks/shares) ownership. A good example is when an issuer is a corporate one. A bond holder has higher claim on assets than shareholders do: that is, in the case of bankruptcy, a bondholder will get paid before a shareholder. However, the bondholder does not share in the profits if a company does well - he or she is entitled only to the principal plus interest. Therefore there is less risk in owning bonds than owning stocks but that comes at the cost of lower returns. Lastly the most confusing thing about bond is the price fluctuation which sets it apart from fixed deposit (the simplest form of financial instrument). The price fluctuate because bonds are publicly traded just like shares. When you buy the bond at par price (say RM1000), yield is equal to the coupon rate (interest), both at 4%. But if the price goes down to RM800, then the yield goes up to 5%. This happens because you are getting the same promised RM40 on an asset that is worth RM800 (RM40/RM800). Conversely, if the bond goes up in price to RM1200, the yield shrinks to 3.33% (RM40/RM1200). In summary, if you are a bond buyer, you want high yields. This means buying bonds at a cheaper price. On the other hand, if you already own a bond, you've locked in your coupon rate (interest), so you hope the price of the bond goes up. This way you can cash out by selling your bond in the future. More recently I have been questioned on my purchase timing of AmDynamic Bond as it is dishing out below expected historical returns. First. What I want from bonds is at the bare minimum able to provide a return similar to a fixed deposit although the risk is higher. Bear in mind this is the 'bare minimum' and not the expected return which should always be slightly higher for the risk I'm taking. So far it has given me 3.28% year-to-year (since purchase) which is not far from a fixed deposit rate a year ago. Second. The bond is meant to stabilize the overall portfolio. A bond can be compared to a defensive equity holding where the price will move up and down but you will get income along the way in the form of interest (in the comparison of equities from dividends). The bonds can do this kind of job (provide stability) if you own them and own them for the long term. Third. Buying bonds in a potential rising interest rate environment is NOT counter productive towards returns. Rising rates push bond yields up and prices down. Longer-term bonds are generally more sensitive to rate hikes than shorter-term securities so holding short term ones are generally safer. Certain bond markets do well in this type of scenario. Higher yielding bonds and their fatter payout cushions the blow from rising rates while credit spreads should tighten as the economy gradually improves. Investors can have greater confidence in high-yield securities since a healthier global economy lowers the risk that such a marginal borrower will default. Once rate increases begin, bond investors have proven counterweights at their disposal and the most effective strategy may be to hold bonds or bond funds with staggered maturities, a tactic known as 'laddering'. A good fund house e.g. AmDynamic would employ such tactics as mentioned above. I have said before and many times->Historical performance cannot be used as a perfectly accurate predictor towards future returns. Use it merely as a guide and reference.